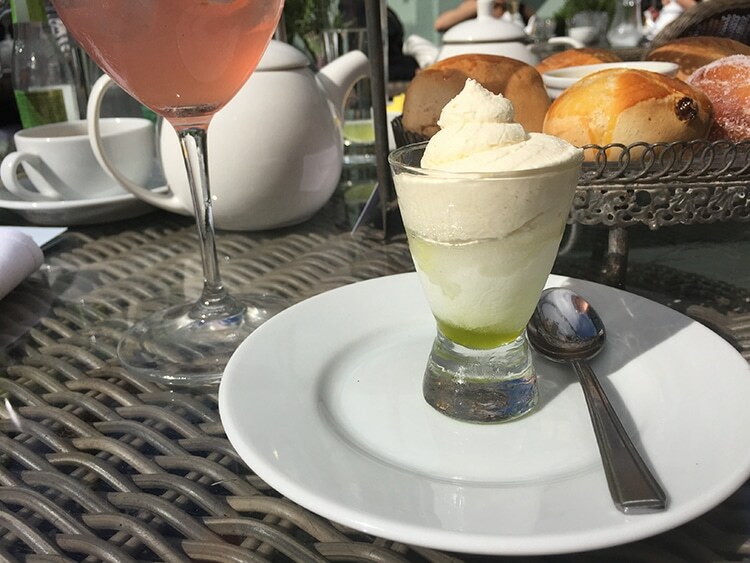 The tradition of afternoon tea has, over recent years, managed to convert itself into one of the more civilised and very fashionable means of socialising with friends. Everywhere from trendy hotels to tiny cafes now offer their version of the service, and Brighton even hosts a couple of venues solely dedicated to the quintessentially English pastime. Whilst on maternity leave I got to experience many of these. It seems that afternoon tea is the default activity for those who can’t enjoy their local pub like they used to. 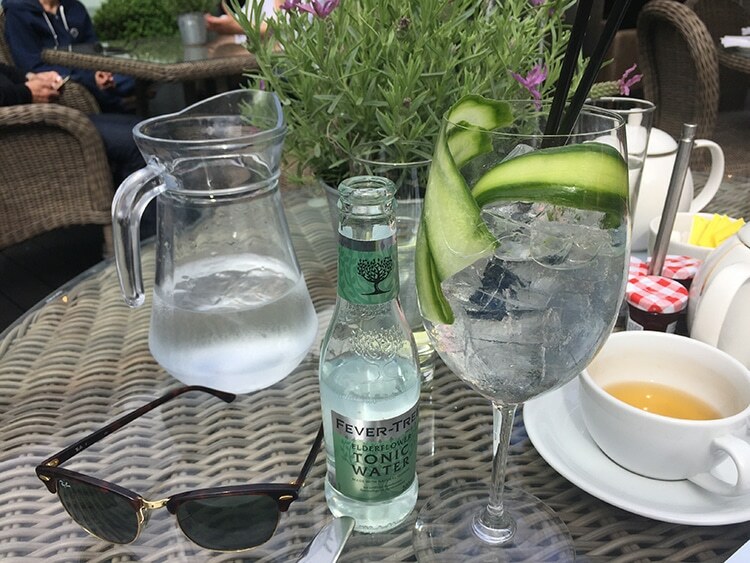 Thankfully, on the beautiful hot summer’s day that I visited Hotel Du Vin, there were plenty of gin options too, so perfect for any occasion whether it be a baby shower, birthday, hen party, or just a catch up with friends. 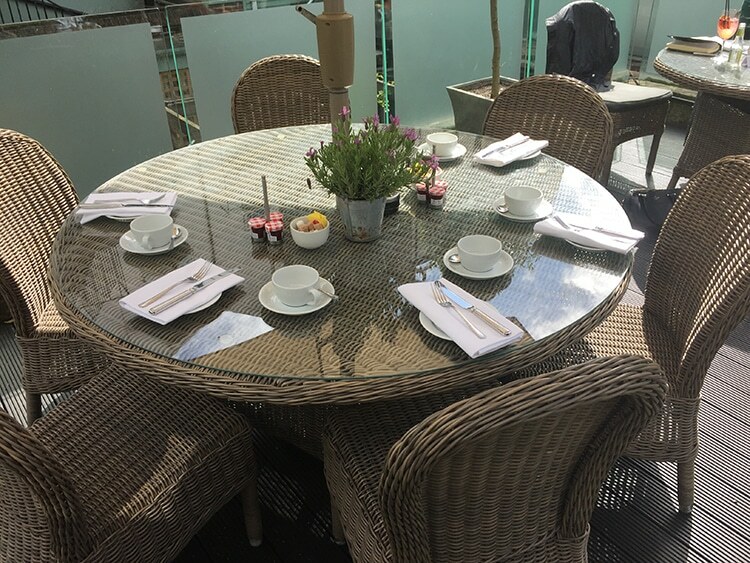 Due to the stunning weather, we were seated outside on the balcony of the standout mock Tudor building on Ship Street, overlooking the sunny courtyard, but inside the dark wood, leather seats and historic art make a very cosy setting if you were to visit on a cooler day. Our attentive and friendly waitress, Saffron, saw us to our table and talked us through the tea selections and debriefed us on the food menu. First and foremost, with the clue in the name, is the selection of teas. Boasting ten Twinings infusions, from the light and refreshing Jasmine Petals & Pearls, to a classic strong and rich Assam, there’s a tea to suit everyone. 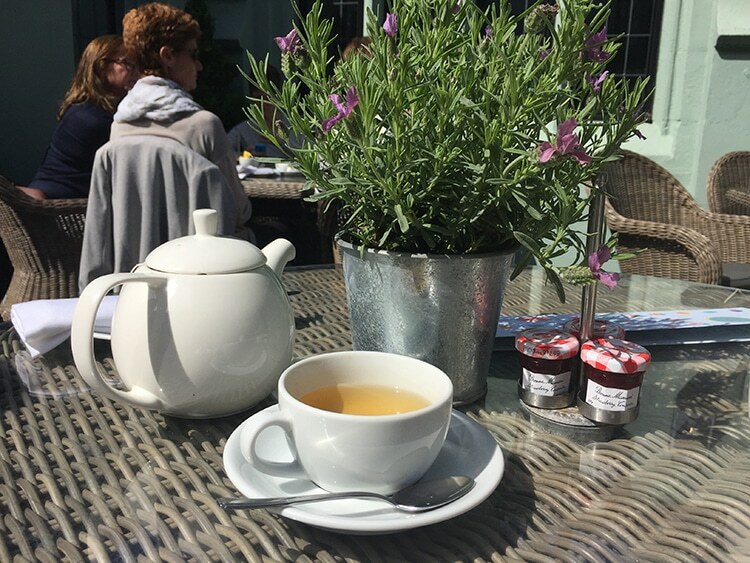 After something refreshing, we chose the sweet Moroccan Mint with Rose and the fruity Elderflower & Blossom Darjeeling teas, which complemented the day perfectly. 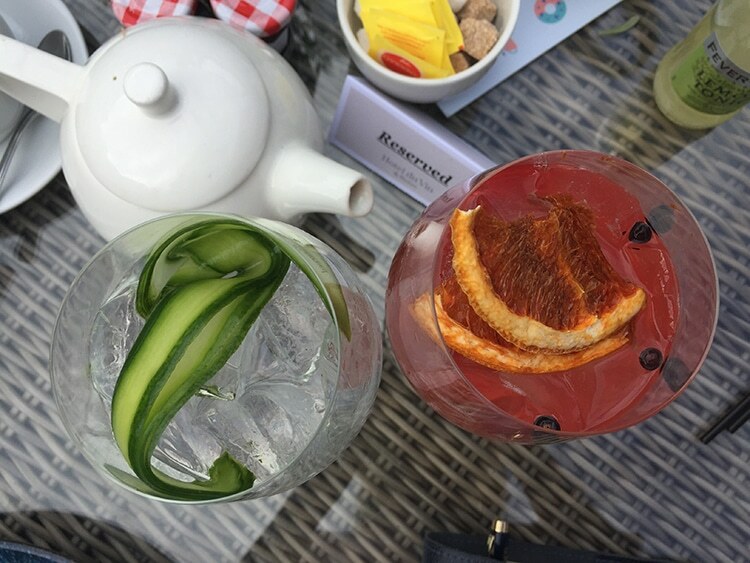 If it’s a livelier afternoon you’re after (come on, this is Brighton), the extensive gin & tonic menu will keep you entertained. 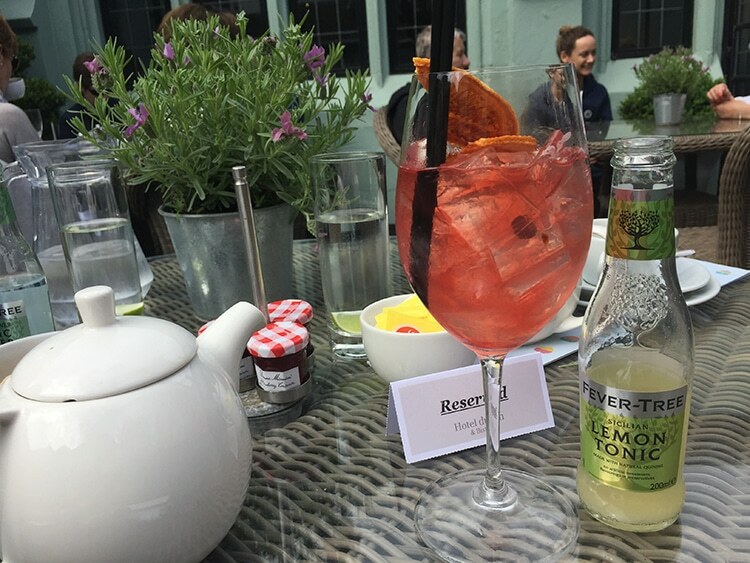 We sampled the very on trend Hendrik’s & Elderflower, and the bright pink Sipsmith Sloe & Lemon Tonic. There’s also a selection of bubbles, the ideal accompaniment if you’re there to celebrate. 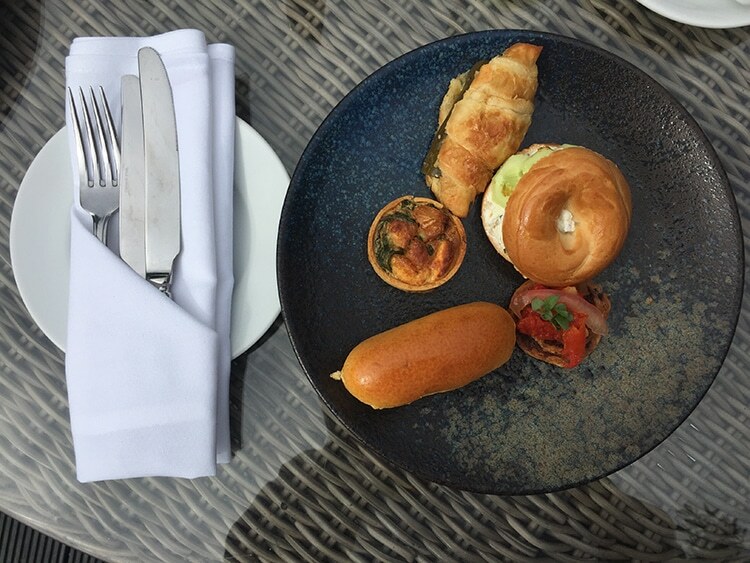 The afternoon tea is served as 2 courses, with the first being a substantial selection of savoury filled croissants, subs, bagels and a pastry. The traditional selection featured egg, cheese, smoked salmon and ham, and I had a vegetarian selection where the fish and meat was replaced with grilled courgettes and cucumber slices. A light and crispy goat’s cheese tart is on both plates, as well as a homemade tomato pastry. The real pièce de résistance is the dessert tray. 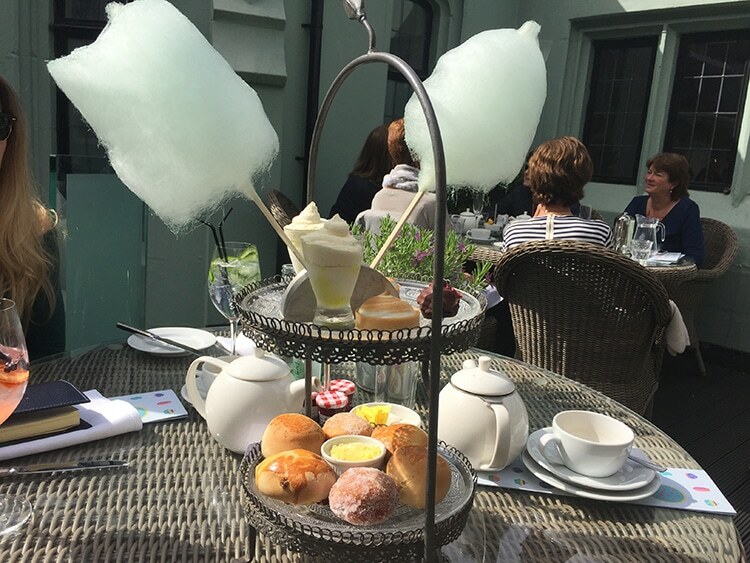 Beautifully served on a tiered stand are homemade scones and rhubarb and custard filled donuts, with an unexpected twist of delicious gin & tonic sorbets, dark chocolate tea cakes and eye catching, Instagram-worthy apple candy floss decorating the top of the tower. Like something from the Mad Hatter’s Tea Party, the presentation of the sweets catches everyone’s attention, with several people commenting on how extravagant it looks! The huge and varied selection was more than enough for two of us, with something for everyone. 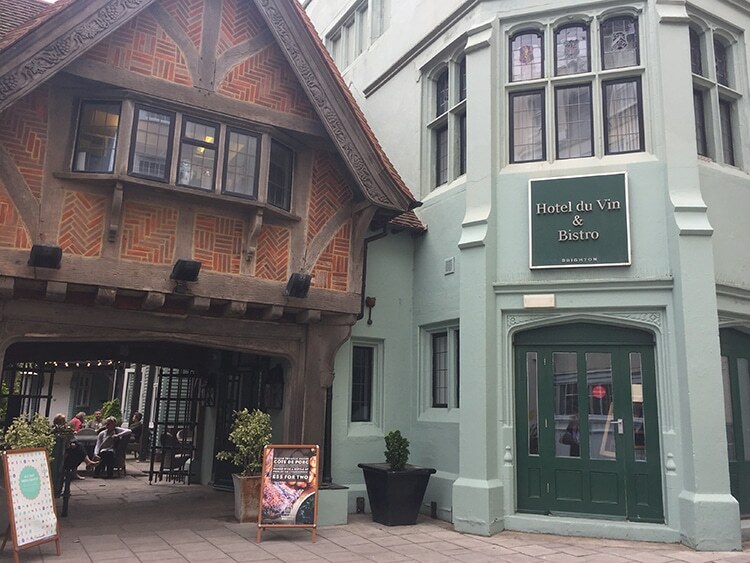 At just £20pp (a competitive price compared to other hotels in Brighton), the Hotel Du Vin afternoon tea captures Brighton’s eccentricity perfectly, and brings an additional serving of charm and fun that would make any celebration just that little bit more special.